Volunteer Checking Account current balance is $353.19. 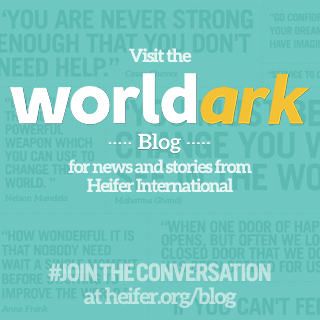 There was no activity on the Heifer International side of the account. From the barn dance, a donation check of $300 and a credit card donation of $150 were sent directly to Heifer International. The club was active this year making bracelets to sell for donations to Heifer International. Club officers Erica Solberg and Adrienne BelAire, both seniors, will be followed by a team of enthusiastic juniors next year. Erica presented approximately $125 to our group to forward to Heifer International. Great Work!!! Some interested students may help table this summer at Napa Farmers’ Market. Ann and Evie will send an acknowledgement to the club for their work and donation. The note will include recognition of an animal purchase equivalent. A sheet was passed around on which volunteers could report their hours worked on Heifer projects. Building supply of utensils, glasses, etc. Set a “re-schedule” deadline for each event. Resolve A/V equip costs/issuesPurchase or rent equipment? Jill’s email outlining possible volunteer opportunities in support of AKA’s Heifer activities was discussed. Jacquie will check her calendar to see if she can join the San Francisco event on July 23-26 at some point. She will let Evie and Jill know. Contact Kathy Mawer if you want to do an additional tabling stint or if you wish to change a time you signed up for. 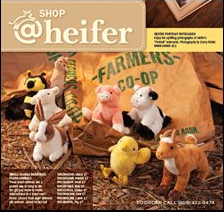 Linda D-Y reported that the center will have additional display space for Heifer materials this August. She suggested the “Heifer School Team” meet this summer to discuss ways to encourage use of the kits. Possible team members: Nancy, Marlene, Kathy, Ann, Stefanie. It was decided to hold off trying to seek a tabling opportunity at this activity until next year. Giving Booklet: Napa Valley Can Do is considering developing a booklet of giving possibilities for the Napa Valley. Linda D-Y will seek more info about how that project may proceed and let Evie follow up. Our discussion of Chapter 4 was postponed until next meeting. Evie will still lead the discussion. Watch video linked on page 72 for next time. Heifer Planning Model: At our next meeting we will use the Heifer planning model to do some planning for the future. We will focus on two of the four planning elements: Defining the Situation (where are we at) and Envisioning the Future (where are we going). Bring your ideas and comments. Consensus at this meeting was that we need to begin planning events sooner. We need to give ourselves more lead time with events and not be trying to do everything at the last minute. Next Meeting: Saturday, July 14, 9:30 A M, First United Methodist Church, 625 Randolph Street, Napa. 0 Response to "Minutes - Napa - June 10th, 2012"